Re: Boiler House Refurbishment and Associated Works. I write in reference to the works outlined above. 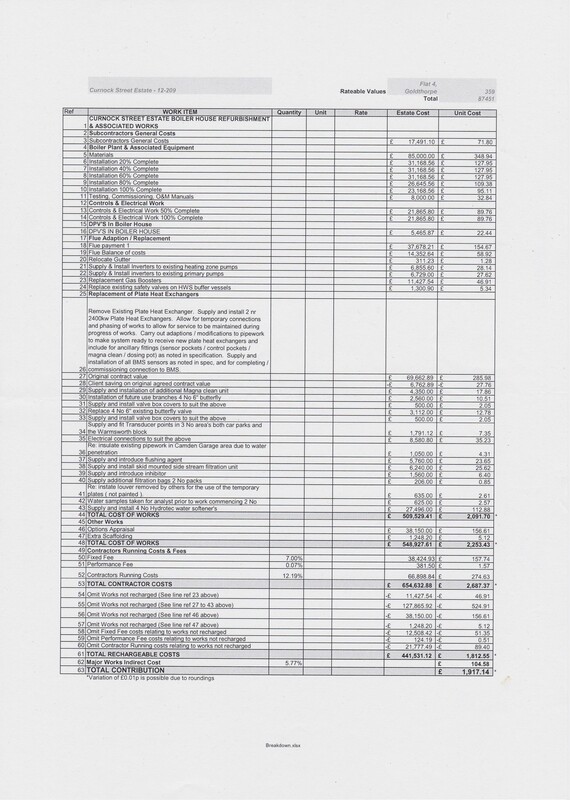 On 01/11/2012 we issued a notice to you detailing your estimated contribution towards the cost of these works. Please find enclosed a demand for the actual cost of these works in the sum of £1917.13. 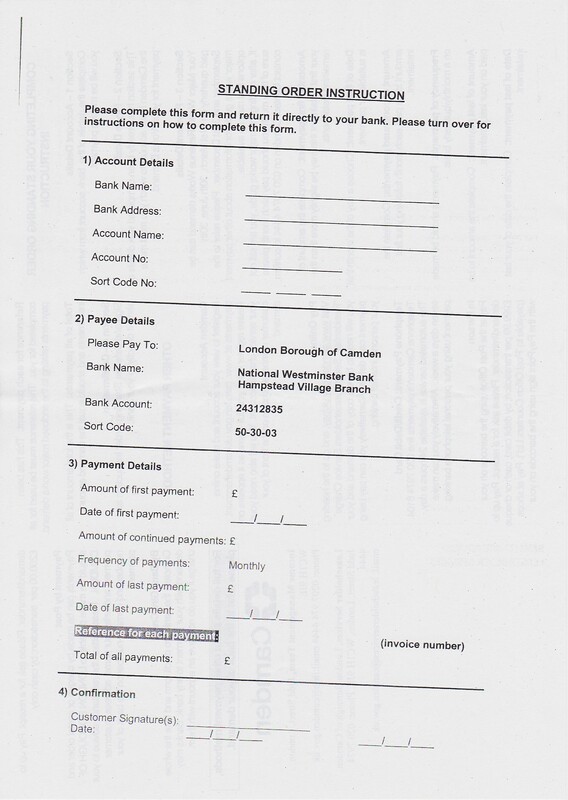 A standing order form has been enclosed for you to make payments towards this demand. Once completed, please return the standing order form to your banker building society. The Council recognises that it can be difficult for some leaseholders to meet the costs of repair bills. We therefore offer a number of different payment options. If you wish to discuss these options, please contact your Leaseholder Officer using the telephone number above, email Leaseholder Services at LeaseholderServices@camden.gov.uk. or write to us at the above address. Also enclosed is a booklet, Paying For Major Works-What Are The Options? We recommend you read this booklet as it describes the methods of payment available to you in greater detail. 1. Your major works -service charges are apportioned to your flat or house on the basis of its Rateable Value. Although Council Tax Bandings replaced Rateable Values some years ago, most of our leases make reference to Rateable Values and the Council has therefore decided to retain them as a means of calculating service charges. 2. Your Block Rateable Value is the total of the individual Rateable Values for each unit in your block. This will enable us to calculate your proportion of block costs. 3. Your Estate Rateable Value is the total of the individual Rateable Values for each unit on your estate. This will enable us to calculate your proportion of estate costs. 4. Your Percentage Apportionment of Block Costs is calculated by dividing your individual Rateable Value by the Total Block Rateable Value. 5. Your Percentage Apportionment of Estate Costs is calculated by dividing your • individual Rateable Value by the Total Estate Rateable Value. 6. The Total Block Costs are those costs incurred in relation to works to your block under this contract (but excluding the cost of any non-structural work to tenanted or void units). 7. The Total Estate Wide Costs are those costs incurred in relation to communal estate works under this contract. 8. Your Estate Contribution is calculated by applying your Percentage Apportionment of Estate Costs to the Total Estate Wide Costs. 9. Your Block Contribution is calculated by applying your Percentage Apportionment of Block Costs to the Total Block Wide Costs. 10. Your Gross Works Final Cost is the sum of your Estate Contribution and your Block Contribution. 11. 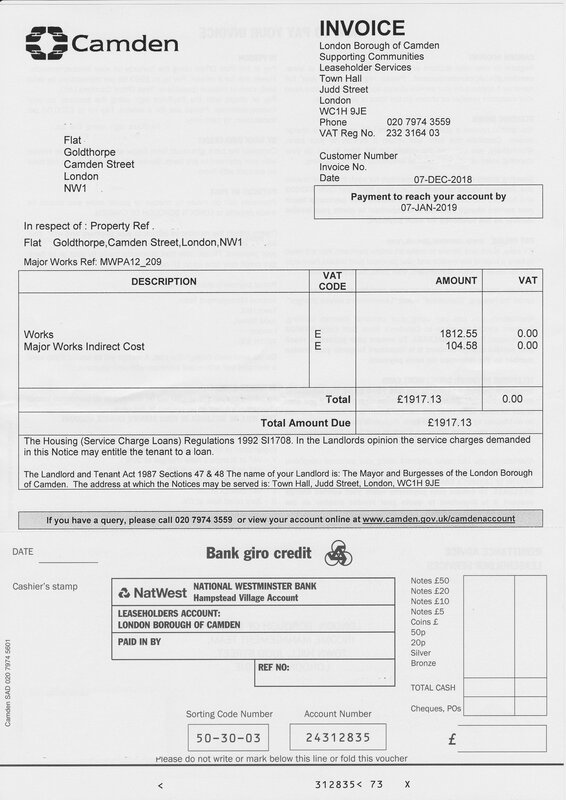 Major works indirect cost covers the Council’s costs in commissioning the works, consulting leaseholders, answering leaseholder queries, maintaining contract information, instruct & record variations to the contract, finalise the cost of the works and calculating leaseholder invoices at estimate & final account. 12. A variation of £0.01 p is possible due to the nature of the calculations; there is some rounding of the composite elements of the charge to the nearest penny. This might give a false impression of arithmetical errors in the pence figures. 13. There are Government grants available for some elements of work carried out to properties e.g. insulation. If Camden has received a grant for carrying out this type of work, where applicable, any credit will be passed onto leaseholders. The Council recognises that leaseholders may not be able to able to make full loan repayments and offers some options to help; these allow payment to be deferred. We advise that you seek independent advice from your mortgage provider and other agencies before seeking assistance from the Council. This option allows resident leaseholders where the property is the principal home to defer payment of capital and interest. A voluntary charge in recognition of the debt due is secured against the value of your property and redeemable when the property is sold. 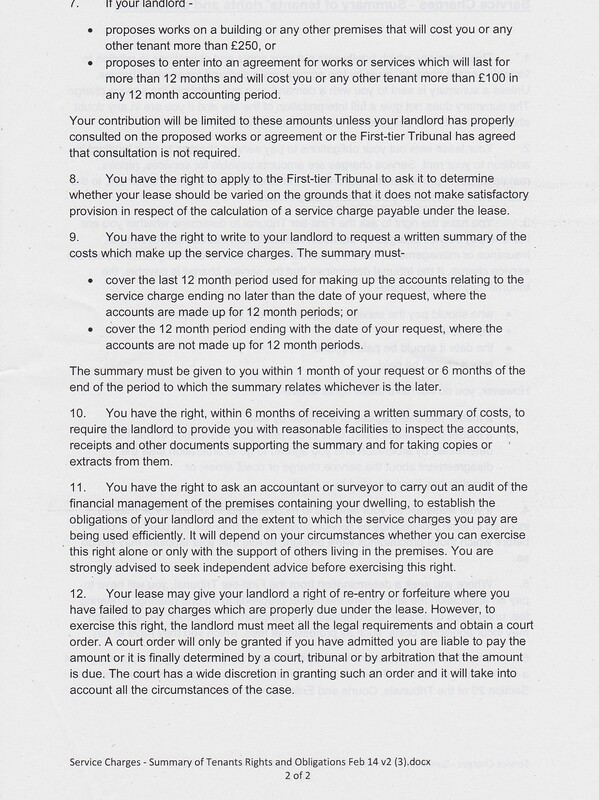 The charge is noted at Land Registry and therefore the property cannot be sold without the debt being cleared. Leaseholders must demonstrate that they are unable to sustain loan repayments or obtain alternative finance. o There is sufficient equity to cover the loan. Only available where the property is the principal home. It’s important to note that annual interest is added to the loan. Is part of the hardship scheme where you may be able to pay the interest or be entitled to benefits, which leaves the capital sum to pay. An interest only payment is charged on the debt thus keeping the charge at a fixed level. You will be expected to pay all interest on the loan but may be able to receive assistance with this through the Department for Work & Pensions (DWP). Leaseholders in receipt of some forms of benefit may be able to arrange for the DWP to pay all or part of the interest due. The loan can be spread over a period of up to 25 years where the interest is paid monthly and the capital re-paid once the leaseholder sells the property. In extreme cases, the Council will consider buying your home back from you if you are having difficulty paying your mortgage and service charges. If we buy back your home you will become a tenant of the property after the sale has been completed. leaseholders becoming a secure tenant and remaining in the flat. Allows a resident leaseholder to defer payment for up to a year where the bill is over £10k in cases where there is financial hardship through a sudden change of circumstances like a job loss. The Council recognises that it can be difficult for some leaseholders to meet the costs of major works bills. We therefore offer a number of different payment options, in addition to that specified in your lease. Options include interest free periods up to 5 years and interest bearing loans up to 25 years along with a hardship scheme that allows leaseholders to defer payment in certain circumstances. • All interest-free payment options are only available if you occupy the property as your only or principal home. • Payments should be made from your bank using a Standing Order Mandate. • Once an agreement has been made you are expected to keep to the terms until the bill is fully paid within the agreed monthly periods. 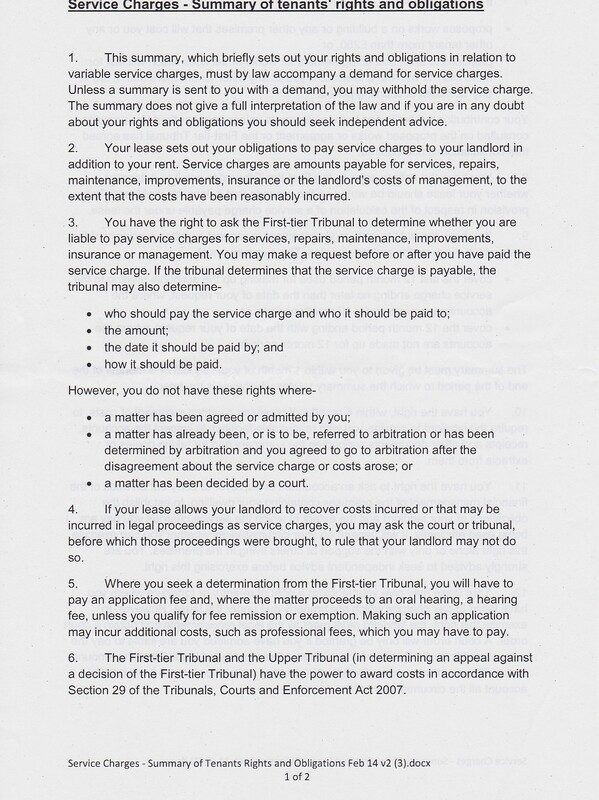 • If you do not keep to the agreement the Leasehold Team will start debt recovery procedures. 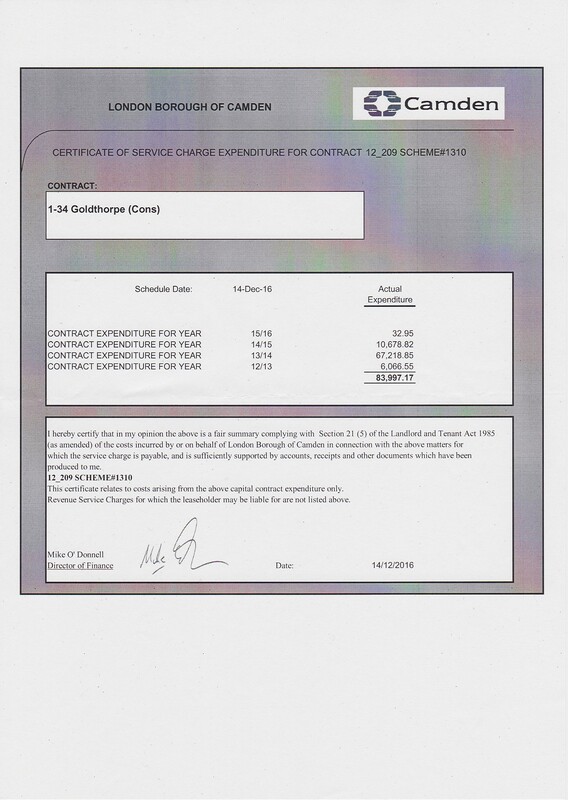 This may result in additional charges to you, as well as interest payable on the original bill. • Please keep your leasehold officer updated with any payment problems that arise. 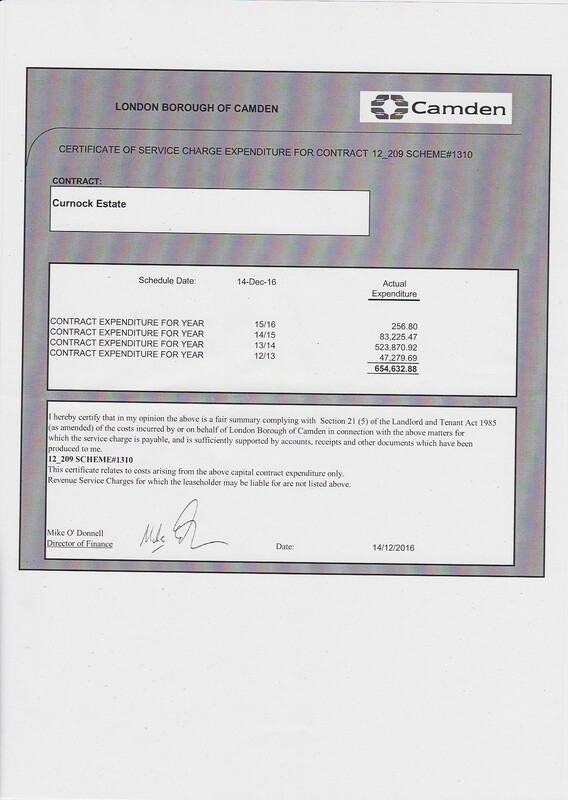 A service charge loan from the Council may not always be the best option. To make a comparison, you should look at the ‘secured loan’ rates offered by banks or building societies. If you have an existing loan it may be better for you to add the sum to your existing mortgage. » This option is available but is not as flexible as Camden’s discretionary loan, which offers longer payment periods. • Discretionary Service charge Loans are interest bearing up to 25 years, any resident leaseholder is eligible and currently attracts an interest rate of 3.13%. • You will be required to pay the legal and land registry costs associated with setting up the loan. • Please bear in mind that you may wish to approach your mortgage-company and request they extend your mortgage to cover the cost of your outstanding invoices. You may also consider approaching another financial institution for a secured or unsecured loan. • Please contact us and we will arrange a suitable time to meet with you.